Starting to make some progress on stripping out the old Peterborough. What a job this is! 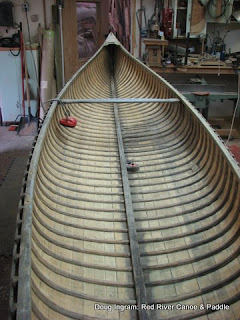 Yesterday I applied stripper again and scraped out the entire canoe for the second time. Then used a small pressure washer to clean out the gunk. Today I tried scraping and sanding it clean. Not much success until I tried a small diameter flap sander on the drill. You can see the spare in the center of the canoe. Spent about 5 hours on this step. Now I have to finish sand the cedar because this tool leaves a lot of scratch marks.